Routing cables and pipes can be a long and complicated element to product design, and with products becoming more and more complex, it’s important that your design process for piping and cables is optimised and as quick and easy as possible. 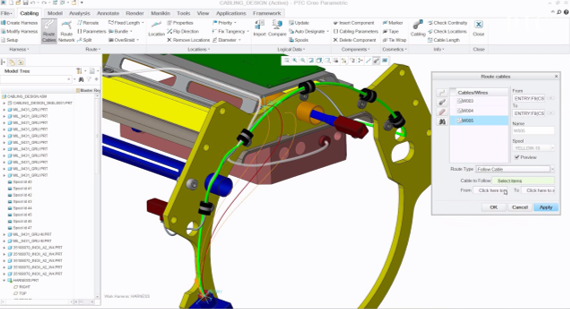 Enter the PTC Creo Piping and Cabling Extension, or PCX. 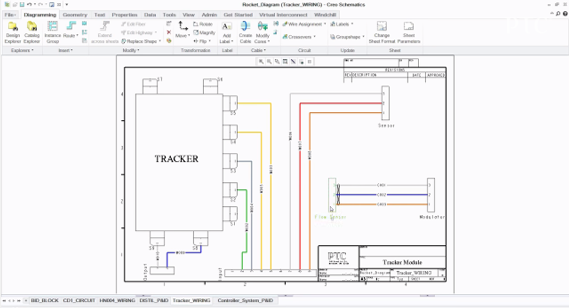 Create routed systems with ease, either directly into a 3D environment, or driven by a 2D schematic. Viewing the 2D schematic means as a designer you can quickly review wiring routes andconnections in the rocket design to avoid errors. If a new wire is needed, this can be added, still in the 2D environment by simply selecting from a library of standards and creating the connection. The 2D environment makes sure that the integrity of your design is maintained, and not compromised by errors. Even better, this environment integrates with both PTC Windchill and standard formats like XML - you can export other wiring and cabling designs right into the extension. The cabling subassembly can now be opened in the 3d environment and the new wire is automatically added to the design. In the picture below, PCX automatically identifies an error - a missing connector - and prompts the user to fix the problem. Once resolved, the user automatically returns to the routing action they were executing when the problem was detected,ensuring a smooth flow to the design process. In PCX, cables can be routed using different options, from simple route to options which provide much more control. Rerouting cables is so simple because you have quick access to the commands. In this design of our rocket, three cables are routed to follow an existing cable route, creating a clean design in seconds. It even gives you constant visuals, checking you have the desired look. Have you got interferences with surrounding geometry? You can fix it quickly by selecting the cable followed by the location to avoid. The 3D cabling loom can be automatically flattened and the individual components can displayed.You can even automatically output the harness as a drawing, including a bill of materials, significantly shortening the product development cycle for products that include cabling. 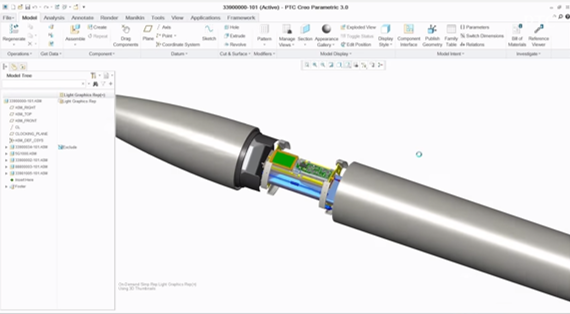 As with all aspects of PTC Creo Parametric, any changes to the 3D design are automatically reflected in the 2D drawing documentation. Undertaking piping design with PCX is very similar to cabling. 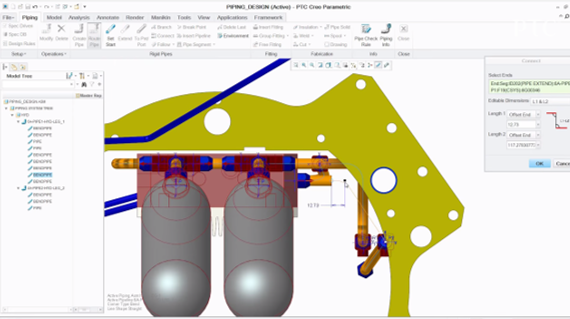 The engineer is once again presented with a dedicated Ribbon UI, this time for piping design. As before, you can select the start point and, referencing an existing pipe, the new pipe is quickly modelled. Again, any changes are automatically reflected in the manufacturing drawings, including piping assembly, bill of material, and individual pipe drawings. 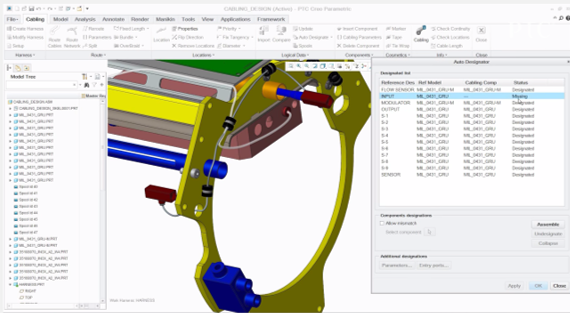 The features in the PTC Creo Piping and Cabling Extension make it unbelievably quick and efficient to create complicated cable and pipe-routed systems, with a choice of 3D modeling or a 2D schematic approach.